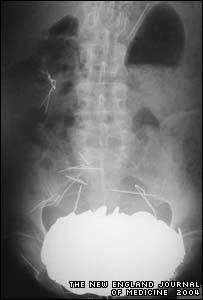 A man who was admitted to hospital in France with stomach pains was found to have swallowed 350 coins, an assortment of necklaces and some needles. The 62-year-old, who had a history of psychiatric illness, had a swollen stomach when he was admitted. He couldn't eat or go to the toilet. But doctors at Cholet General Hospital were astounded when they carried out an X-ray to see what was wrong. They found a 5.5kg mass, the equivalent of a bowling ball, in his stomach. The man's family had previously warned doctors that he had a habit of swallowing coins. 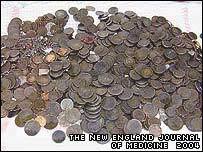 In fact, doctors had removed a few coins from the man's stomach in past hospital visits. The man underwent surgery to remove the coins in January 2002, five days after he had been admitted to hospital. Surgeons found coins worth 4,050 francs. They believe the man swallowed the coins over the course of 10 years. The coins and other items were so heavy they had pushed the man's stomach down between his hips. "He like eating coins," said Dr Bruno Francois, who treated the man. "When he was invited and came in some homes, he liked to steal coins and eat them." Doctors say the 62-year-old was suffering from a rare condition called pica - a compulsion to eat things not normally consumed as food. Its name comes from the Latin word for magpie, a bird thought to eat just about anything. Pica can take the form of eating dirt, ashes, chalk, hair, soap, toothbrushes, burned matches and many other things. While most objects will pass through the body naturally, others need to be surgically removed. Dr Francois said he once treated a patient who ate forks. He revealed details of this latest case in a letter to the New England Journal of Medicine. "This case serves as a reminder of important factors that should be considered in the care of patients who are mentally impaired," said Dr Lindsey Baden, one of the journal's editors.